Correction: The SFMTA Board meeting begins at 2 p.m., not 1 p.m. as previously stated. Depending on the number of speakers, the meeting could last hours. You can view the meeting live on SFGovTV 2. 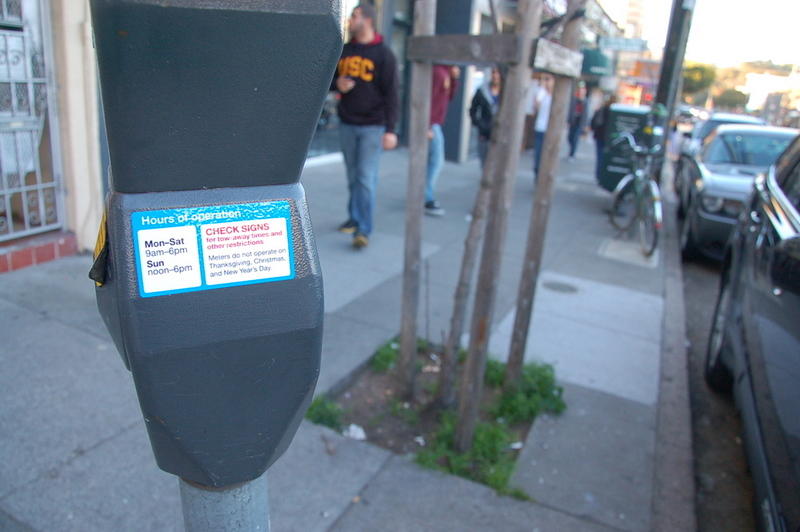 Tomorrow is your chance to speak out about the SFMTA’s proposal to repeal Sunday parking metering, as the agency’s Board of Directors will vote on a new budget that eliminates the $9.6 million in annual revenue that the meters bring in. It’s up to the board to stand up to Mayor Ed Lee, who has sought to reverse one of the smartest transportation policies to begin under his administration with unfounded claims of a popular revolt against Sunday meters. Although SFMTA Director Ed Reiskin proposed compromises, such as re-directing parking enforcement away from Sunday meters, or only enforcing four-hour time limits, the proposal on the board’s agenda calls for a complete reversal of the policy. Lee’s office reiterated to CBS just last week that the mayor is unwilling to accept anything less than free parking on Sundays. Reiskin and the SFMTA Board, all mayoral appointees, appear poised to undo the hard-fought policy success, even though it has cut cruising times for parking in half and has increased parking turnover near businesses by at least 20 percent. Even though the push against paying for Sunday parking appears to be coming from church leaders, Mayor Lee claims it will win voter support for three transportation funding measures proposed for November’s ballot. Yet it’s not clear that will win over many votes, given strong support behind Sunday meters: The Chamber of Commerce, the SF Bicycle Coalition, and even former Mayor Willie Brown all declared their support in two Chronicle op-eds published last week. Brown’s support is especially surprising, considering that his views on transportation policy are usually more car-centric. Then again, Sunday meters benefit drivers by making it easier to find a spot, and even Brown recognizes the pro-business side of it. The SFMTA Board meeting starts tomorrow at 2 p.m. at City Hall, room 400. If you can’t make it to speak during public comment, you can email the board at MTABoard@sfmta.com. Would we like to have back tons more traffic, pollution and danger to cyclists and walkers? Then we should make parking free on Sundays. I’m baffled that Mayor Lee won’t let go of this bad idea of repealing Sunday metering. He probably believes it will make him look weak if he backs down from repeal. Well, guess what? It looks worse when you refuse to listen to such a broad coalition, from the Chamber of Commerce to the Bicycle Coalition, who want to keep metering. I think less of Mayor Lee for stubbornly refusing to acknowledge that Sunday metering has worked well and should be retained. I urge you in your new budget to keep Sunday Metering. I am a former San Francisco resident who was forced to leave after being evicted from our apartment, and not being able to find a suitable replacement. We nonetheless come down to San Francisco to visit, and this usually happens on Sundays. Sunday metering has been a godsend because public transit from the North Bay is infrequent and slow on the weekends, so we typically drive, and the ability to easily park and go about our business is worth the pittance we pay the meters compared to gas and tolls. The metering has made it possible forus to find sports in our old Noe Valley neighborhood with ease on Sundays. think that we need the funding stream from Sunday metering to keep MUNI service up, which is far more valuable to the Citizens of San Francisco than free parking ever will be. Healdsburg, Ca – Formerly Noe Valley SF. To be clear, If they decided to add back free parking Sunday it will improve safety? Major Lee is pressuring the board to vote against their beliefs by threatening not to reappoint them. The board knows this is right, it’s Lee we have to pressure. All things being equal, I think the SFMTA should actually be increasing parking revenues, by instituting nighttime (>6pm) meters along active dining/entertainment corridors like Valencia and Fillmore. However, at a minimum, we need to keep the proven Sunday program. Thank you for your service and consideration of this comment. Please note: although I am a member of the SF Pedestrian Safety Advisory Committee (PSAC), I am commenting as an individual. My name is Henry Pan. I am a native, car-free, and transit-dependent San Francisco resident. I urge you to not turn back the clock by ending Sunday meter enforcement, and further balance the SFMTA budget on the back of transit riders by increasing transit fares. First, Sunday meters have never helped businesses, drivers, and road users more than ever before. According to a study done by the SFMTA, time circling for a parking space was cut in half, because the turnover rate increased. As a result, business has increased. In fact, when Chicago eliminated Sunday metering, some businesses claimed they lost 20% of businesses and asked for it back. But it’s not just businesses that have benefitted. All road users, including bicyclists, pedestrians, and transit riders, experience less congestion and pollution, as well as fewer rambunctious drivers impatiently searching for parking as a result. To help businesses even more, I suggest that the agency explore implementing evening meters, as autocentric locales like Walnut Creek have been doing. Second, I was made aware that the budget calls for increasing transit fares. This could not have come on a more worse time. Muni service is deplorable, and while there are plans to improve service, it should not be paid for by passengers who must suffer through it on a day-to-day basis. Why should transit riders pay more for transit while motorists are heavily subsidized for driving? Before burdening transit riders more with fare hikes with degrading service, make drivers who are making the system worse with their congestion pay for improvements to get more people on transit moving. I sincerely hope the agency does not consider eliminating Sunday meters and increasing the fares for transit riders. I heard both side of feedbacks. I would rather agree on passing San Francisco Free Meter on Sunday`s once again. Seeing massive parking meters front of residential area i will have go with the Free Sunday meters. * Allow cars people get to where they want (In a convenient time) to help support funding Businesses . If you care about the reasons you cited then you should be against free meters. Underpriced parking leads to congestion which leads to all the problems you mentioned. This has been proven both by independent studies and by SFMTA’s own look specifically about the effects of Sunday meters and the lack thereof. The MTA’s own study confirms the many benefits of Sunday parking meters (please see http://sf.streetsblog.org/wp-content/uploads/sites/3/2014/01/Evaluation-of-Sunday-Parking-Management-12.10.2013.pdf for their study). Free parking promotes automobile use and automobile use is the # 1 threat to pedestrians and cyclists. Free meters CAUSE congestion and lower turnover, because people have to circle longer to find parking. (The SFMTA’s own data shows that cruising time to find a parking space has been cut by about half since Sunday metering began.) And free parking attracts more drivers in the first place – some people will choose to take transit if they have to pay to park. If you want to reduce congestion, pedestrian and bicycle injuries, delays to Muni, and “bad smoke”, then you should be AGAINST free meters. Since you’re playing make believe, I support sunday metering because it improves literacy, whitens teeth, and makes birds sing. One thing I really don’t understand is why the mayor says this would support passing the bills. If MTA doesn’t need this ten million dollars, then they sure don’t need to tax me. I wonder the same. Is it some simple political calculus that enough voters will go “yay free Sunday parking” and vote for the bonds? I don’t get it. Is this meeting not going to be on sfgovtv??? SF Gov TV hasn’t answered my tweet, and I also left a phone message, but the SFMTA is saying they were told it would be televised. Confirmed: the meeting will be televised. SF Gov 2 as usual. Maybe this is a sort of threat. Mayor Lee is telling us, “If you want transit, you’re going to have to pay pass his bonds” because he’s making it clear Muni’s existing funding dedicated to driving. But no way I’m voting for anything if parking goes unmetered and SFMTA refuses to put in a northbound bike lane on Polk. Whatever the idiots at the SFMTA might think, I ride in both directions. And SF moves backward. Lee has got to go.